The Pope catches a ride in an Italian Army helicopter. The unexpected resignation of Pope Benedict XVI has raised a lot of questions about his motivations and the future of the Catholic Church.One of the less pressing concerns is what he will do with his remaining years. As it turns out, he could spend his time flying a helicopter. 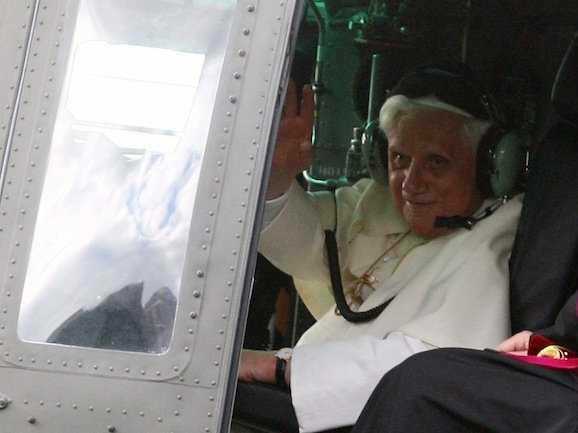 According to a list of “interesting facts” compiled by the Catholic News Agency (via New York Magazine), the Pope has a pilot’s licence for the papal helicopter, and enjoys flying between Castel Gandolfo, his summer residence, and the Vatican. We’re not sure if he’ll still have access to that chopper, but someone would probably be happy to give him his own. In any case, he’ll need a ride to the helicopter pad: The Holy Father does not have a driver’s licence.